Tesla’s solar installation on the Hawaiian island of Kauai is not just a product launch of the company – it’s the first real proof the company’s offering that its acquisition of SolarCity is not only smart, but necessary. Necessary, because it will help Tesla achieve its grand vision of making solar (and other renewable) energy a practical and cost-effective option for power generation everywhere, not just where the sun shines strongest. At the unveiling of the Kauai power facility, Tesla CTO JB Straubel looked a little out of place with his tucked-in blue shirt and dark pants, speaking as he did in a lineup that included numerous Hawaiian government representatives wearing flower print shirts and sandals. But Straubel seemed confident and at ease despite the visual discrepancies, if more understated in his enjoyment of the event than the gregarious local utility executives. There’s good reason for Straubel to savor the moment, of course – some financial observers had been wary of Tesla’s acquisition of SolarCity, following the announcement of its intent to do so last year, and continuing through the closure of the deal in November. Why, the critics argued, did it make sense to tie an electric car maker to this company that made and sold solar panels? 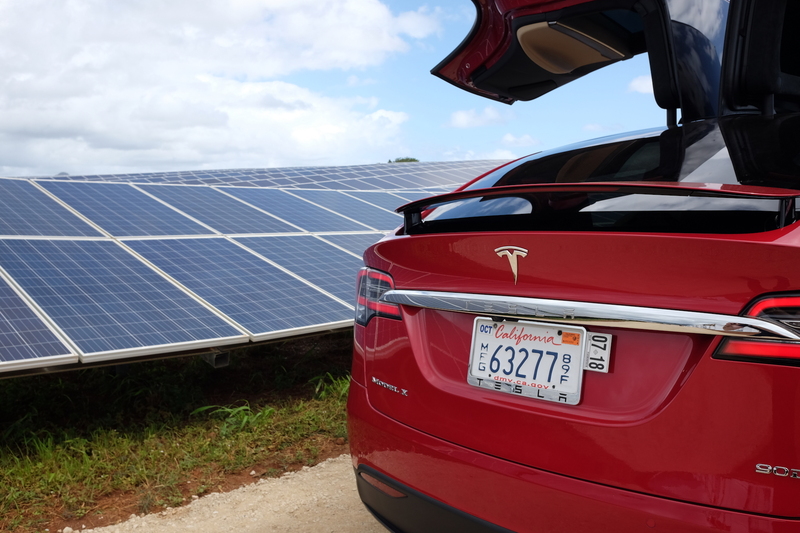 A Model X stood ready for inspection by attendees at the Kauai solar storage facility launch. Tesla acquired SolarCity in November 2016. It was a question that Tesla seemed to think had an obvious answer; Tesla CEO Elon Musk replied to questions about the logic behind the tie-up with obvious exasperation at multiple press events and during quarterly earnings calls. Asked about whether SolarCity might prove a burdensome financial risk for Tesla to take on, Musk initially demurred before being seemingly unable to resist calling the question dumb and highlighting why, based on current balance sheets, the opposite was actually true. But nothing can answer critics quite like a demonstration – and Tesla has now shown why the two companies stand to benefit from being under one roof in a few different ways. The first came before the ink was dry on the acquisition, when Tesla revealed its solar roof tile product, at an event co-hosted by SolarCity, which also launched its Powerwall 2 home energy storage solution. The second was the Kauai facility unveiling, which showed how Tesla can scale its potential in the consumer market to suit ever-larger projects for commercial and utility clients, too. Solar panels blanket a large clearing on the Grove Farm land the Tesla facility occupies, lined in undulating waves on the softly rolling hills. It feels like you’re standing in the center of a crown of mountains, overlooking an oddly geometric and unnaturally blue man-made lake. Rows of Tesla Powerpack 2 commercial batteries stand as silent white monuments next to the angular artificial lake, rising up in stark contrast from the roan red clay earth that’s also used to make pigeons for a nearby shooting range. 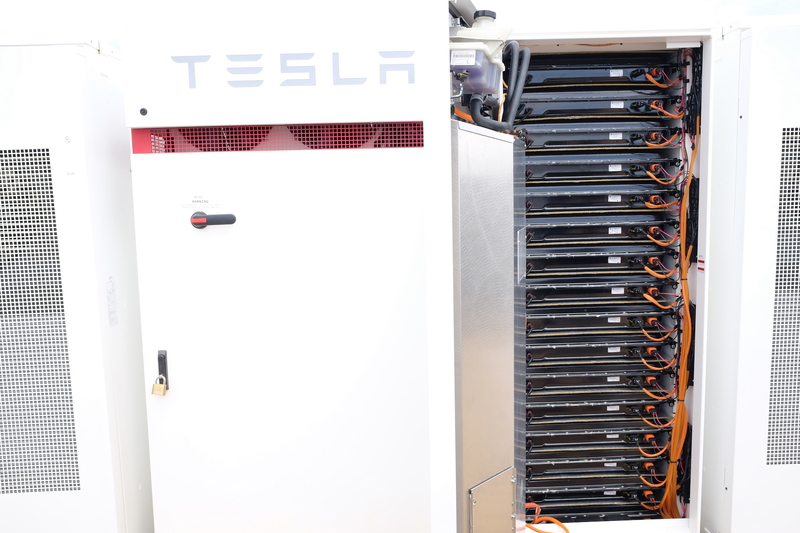 Tesla’s Powerpack 2 storage arrays stand in long rows next to the field of sun-soaking panels. The whole facility generates 13 megawatts of energy, which adds up to around 19,438 MWh of electricity per year, and can store up to 52 megawatt hours of power. It does this with a cost to Kauai of 13.9 cents per kilowatt-hour, locked at that price for the duration of a 20-year contract. That’s under half the price the island currently pays for power generated from burning diesel fuel, which is its prevailing source of energy. 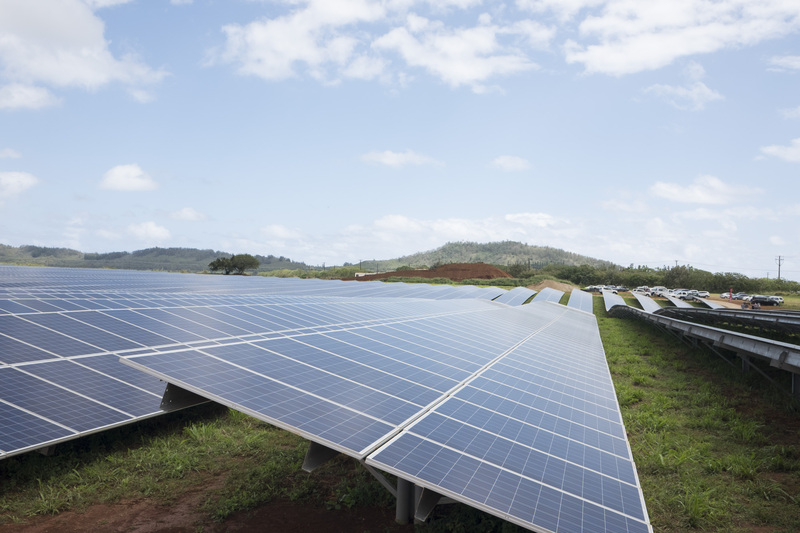 The new solar storage facility can build up enough energy to power 4,500 Kauai homes through the night, which is a significant number of households given the population of the island was at 67,000 as of the last U.S. census. Not only does direct power generation without a storage element rely on good sun exposure, but it becomes a liability rather than an asset when deployed in large numbers across a relatively small community, or in high percentages of households in general. Solar panels adorn roofs across Kauai – you can hardly drive through any residential or commercial areas without seeing a handful of installations. A look inside one of the Powerpack 2 units, with its many rows of lithium-ion storage cells. Each Powerpack 2 can hold 200 kWh of energy. 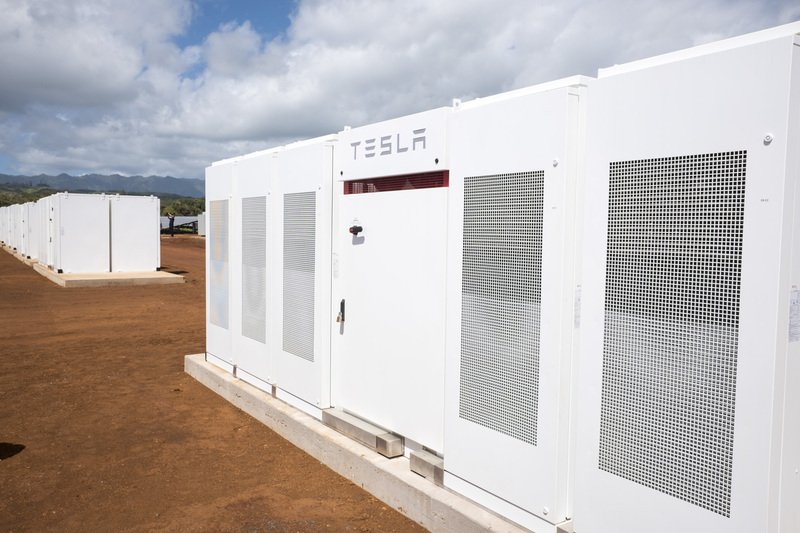 The Kauai facility is meant to show what Tesla can offer for higher-demand commercial projects, and it’s a stake in the ground that’s designed to pique the interest of energy providers the world over – not just those perfectly situated to make the most of available sunlight, according to Straubel. Straubel says Tesla’s in talks with many other clients in different locations currently around deploying projects like the one in Kauai, though it’s not ready to start talking about specific locales and customers just yet. He said that between projects either in the pipeline or in progress, we should soon see a significant ramp of projects like this one. Rows of SolarCity panels stand angled to maximize their solar energy capture, with just enough space between for a person to walk comfortably. Indeed, quantifiable renewable sourcing goals for power are held by many global city and state governments, and it’s clear that without a storage component for sources including solar and wind, getting past a tipping point of around 30 percent or so can be incredibly challenging. Any contributions in this regard can help push past those hurdles, especially in locations where significant resources have already been committed to building power generation infrastructure. Tesla’s SolarCity acquisition, viewed in the light of its first large-scale project since the deal has closed, begins to look more like the perfect combined entity to address a new and growing market among states, utilities and large-scale commercial power consumers. A bit like how, viewed from a low angle, Tesla’s Kauai solar farm looks like a gently rolling sea of panels that extend endlessly into the distance.